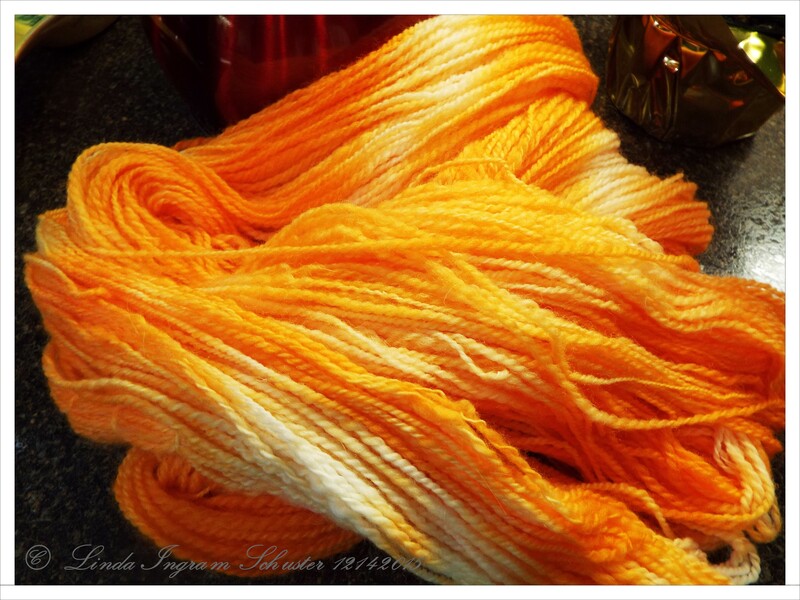 Posted on December 14, 2015	by Linda S.
This entry was posted in Crafts, Fiber Preparation, Handcraft, handmade, Handwork, Historical Textile, hobby, Spinning, Weaving and tagged dye, dyeing, kool aid, orange, spin, spinning, spinning wheel, variegated, wool, yarn. Bookmark the permalink. How fun! Looks like turmeric! How colorfast are these Kool-aid dyes? Do you know if they fade with washing? I like the variegated look. Teri.. I’ve used kool aid for years and have never had anything fade. I’ve also used an acid dye (black and red) and they both continued to fade every time I washed them. I must have done something wrong.. 😦 I love kool aid because it is non toxic, but it takes a LOT of it if you want a deep rich color. Happy New Year! I just found your blog. It is very interesting and entertaining. I wanted to let you know that my wife, Ginger, and I have opened a yarn shop in the Old Town in McKinney. I actually found you from an old review of the shop that used to be here called Yarn Again. We are upstairs in the Doozie’s Corner boutique. Stop by and see us! Hi Tom and Ginger… I most certainly will stop by! Very happy to hear from you.